Recently, a dozen members from the Fabrication Sales, Estimation, and Drafting departments decided to take their camaraderie into team competition. 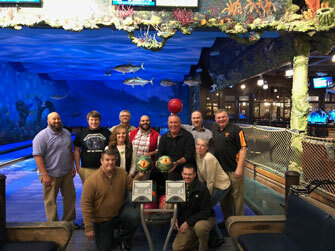 The departments decided to play for annual bragging rights by splitting up into two collective teams for the First Annual Kingpin Industrial Products Bowling Tournament. Over the period of an hour, the team play came to a stalemate. There were some notable achievements to report, including: Rodney Banks had the highest average score; Jeff Roberts had the lowest score in each of the games, also gaining the record for most consecutive gutter balls thrown (6). The team members were pleased with the outcomes of the event and are already planning for next year’s tournament.